This page provides access to several of the things I have written about Rondônia, which is located in the western portion of the Amazon Basin in Brazil, near the Bolivian border. I spent the (northern) summer months of 1996 and 2000 conducting research in Rondônia, and continue to write about it and to maintain friendships there. In March 2003, I returned for a short visit to follow up on two different writing projects, and I took a student with me for the first time. For the best summary of my work read Post-Frontier Towns of Rondonia, Brazil, which I wrote for Bridgewater Review. For a very brief introduction to the state, read Rondônia, which I wrote for the Enclyopedia of Latin American History and Culture. My informal newsletters and web pages about travels to Brazil are known as Folha da Frontera. Volume I is a series of three newsletters I sent to friends and family while I was in Rondonia. Volume II provides stories and photos from my return to Rondonia with the entire family in May and June 2000. My wife Prof. Pamela Hayes-Bohanan posted excerpts from the journal she kept during this trip. Volume III describes a research trip with a student to Rondonia for Spring Break 2003. This was a brief trip, but gave me more opportunity to spend time in the rain forest than both of the previous trips. Volume IV (NEW October 2004) is not about Rondonia at all, but rather my first real venture to the southern part of Brazil, where I attended a conference in Florianopolis and took a brief tour of Rio de Janeiro. My dissertation on frontier urbanization in Rondonia. This link takes you to the abstract, which summarizes the work, and then to the whole thing, including a massive bibliographyof works in English, Portuguese, German, and Spanish. Stay tuned for more; I'm usually working on some project related to Rondônia! The photo to the right is an unusual image of me in the actual rain forest. Because I study deforestation and the urban landscape of Rondonia, I had actually spent very little time in the forest until my 2003 visit. I traveled with an undergraduate biology student from Bridgewater, who had received a small grant to study plant succession in an area whose clearing I witnessed in 1996. This photo was taken with a flash during the day in an older-growth area. The tree behind me has a trunk diameter of about one foot, but the large buttresses support the tree, whose roots reach only a couple of inches into the soil. My first book! 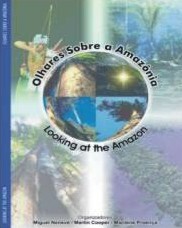 Ten authors from Brazil, the U.S., and England wrote this ground-breaking book on how the Amazon region is perceived. The book was launched with a video conference at an Internet cafe in São Paulo! My contribution is entitled What a Difference a Century Makes : Images of the Frontier in Amazônia and the American West. During my March 2003 visit to Porto Velho, we met with the publisher and agreed to release a second edition of the book, with all contents to be in both English and Portuguese. The first edition had sold out in one year. I will be co-editor of the new edition, and will manage distribution in the United States. CINEAMAZÔNIA is a film festival that promotes the production of national films and videos which are narrated or sub-titled in Portuguese and have the environment as their central theme. CINEAMAZÔNIA considers itself an “outer” of great artists, attracting investments and projecting a culturally and ecologically positive image of the Amazon region. The web site is in Portuguese and English. 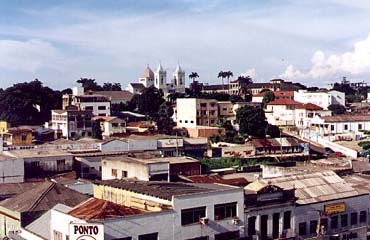 The 5th annual festival will be held in the city of Porto Velho, from the 13th to 17th of November, 2007. SAMBAZON is not only a beautiful neologism -- it is also a fruit drink! I was quite delighted to discover this company. Not only is it doing important work to help in the Amazon region , but it is also allowing me access to fruits that I crave between visits and that are otherwise impossible to find in the U.S. These links relate specifically to Rondônia. For links related to Brazil as a whole or the rest of Latin America, see my Latin America Resources page. Some of these are in Portuguese. If you do not read Portuguese, enter the URLs for the sites below in the Babelfish language translator , to get a rough but pretty decent English translation. As Linhas is an excellent site by Lee Clockman, an amazing photographer and fellow former Texan whom I met on my first trip to Rondonia. He has been working for several years on an impressive series of photographs that document the process of deforestation in the region. Damned if you do describes a pair of hydroelectric dams proposed for the reach of the Madeira River just upstream of Porto Velho. In my opinion, these dams would make the urban transormation of the region complete, for better and for worse. 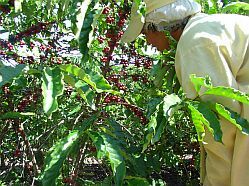 I recently learned that Rondonia is now the sixth-largest producer of coffee in Brazil, and the second largest producer of the conillon variety. This came as a shock, because I thought I knew something about coffee and something about Rondonia, and I was certain that no decent coffee can be grown there! Unfortunately for the land, the people, and the consumers, quantity is more important than quality in Brazil's coffee production, and competition from Vietnam (now the world's second-largest producer) is pushing coffee into some fairly unusual places. A Brazzil magazine article, Fleeing the Cold, describes how this has come about. More detail is provided in Chapter 6 of Nigel Smith's Amazonia - Resiliency and Dynamism of the Land and its People. The Brazil Travel site has an informative page on Rondonia, and links to pages about each state in Brazil and various travel resources. My friend Dr. Carvalho, who used to teach at BSC, was involved in an important study at Woods Hole that showed deforestation in the Amazon may be twice as extensive as previous satellite-based studies had estimated. Of potentially great importance to the region is Brazil's National Zones of Integration and Development. See the critique from solcomhouse. In Rondônia, the Federal University of Rondônia (UNIR) is my academic home and extended family. My English friend Martin Cooper is working hard to preserve the historic EFMM railroad and to educate people about it. Visit his web site for more of his great photos of Rondônia and to learn all about the railroad. See the Rondonia images that are part of the USGS Earthshots project on global environmental change. In these images, you can see the distinctive geographic pattern of deforestation in Rondonia over time. The Amazon GIS project of the Smithsonian Institution provides a history of Amazon conservation and access to digital maps of the region. Carlos Eduardo Primão's tribute to his adopted home state includes photos, statistics, and an official poem. RONet is the main Internet ServiceProvider (ISP) in Rondônia.It had just started operating when I arrived in1996. Follow links to some of its commercial and personal customers. The tourism section includes extensive photos and histories of Porto Velho and Rondônia. The "album" section is the source of the photo above. Are you thinking of traveling to Rondônia? If so, I highly recommend that you contact Brazil Online Travel at brol.com . I used this agency on my 2000 trip, and again in 2003. In my experience, "regular" travel agents can book flights to Porto Velho (PVH), but only a specialist like BROL can do it at a reasonable cost and itenerary. And no, they do not pay me to say this! For more about each state in the Amazon region, visit Viva Brazil's North page. Educational site raises money for rain forest acquisition and protection. Features map animation of rain forest depletion. Rainforest Action Network is a site for research, news, and activism on behalf of rain forests and indigenous peoples. PLEASE suggest other links or let me know of your own work about Rondônia at jhayesboh@bridgew.edu . Return to James Hayes-Bohanan's Environmental Geography Pages . NOTE: I have removed the circumflex (ô) from some instances of the word Rondônia on this page, because search engines do not recognize it, and only search for Rondonia.